For factory automation applications, Cosel has unveiled what it believes is the first integrated power solution for robotic controllers. 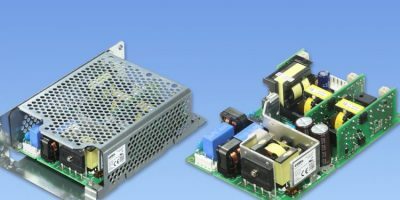 The RBC200F is a 200W, open-frame, configurable AC/DC power supply with triple outputs tailored for robotic controllers and factory automation. The Cosel RB series offers three configurable isolated outputs, with one having a reinforced isolation to power intelligent gate bipolar transistors (IGBT) or equivalent applications. It is certified to EN62477-1 Over Voltage Category (OVC) III, by reducing the need for an extra isolation transformer when connected to a distribution panel, ensuring that the RBC200F power supply simplifies the design process for systems architects while reducing costs, claims Cosel. The RBC200F is digitally controlled on the input and output stages to reduce energy consumption. The RBC200F accepts input voltages of 84 to 264V AC and delivers an output power of 207W. It is designed for convection cooling and can be operated from -20 to +70 degrees C at an altitude up to 3000m, or 9000m in the case of storage. The RBC200F can be installed in any orientation and under standard mounting (horizontal orientation); derating starts from 50 degrees C under convection cooling. To reduce complexity, the RBC200F features three independent outputs. The master output can deliver 24V adjustable 22.8 to 26.4V, or 48V adjustable 45.6 to 52.8V with 144W output power. The second output can host configured modules of 3.3V/5A ; 5V/5A ; 12V/2.5A ; 16.5V/1.9A ; 24V/1.3A ; 48V/0.65A ; ± 12V/0.7A and ±15V/0.7A with a power of 16.5 to 30W depending on the output voltage. The third output can host any of the single output voltage modules in the same power level. For higher voltages, outputs can be connected in series. All output voltages are adjustable via a built-in potentiometer. The master output DC/DC converter is based on an LLC resonant topology to optimise efficiency when the second and third outputs are using quasi-resonant-flyback topology. The RBC200F as an input to output isolation of 3000V AC, and an input to ground isolation of 2000V AC. The isolation voltage between the three outputs has been optimised for robotic controllers applications. Isolation between the master output and output two corresponds to a functional isolation of 500V AC when the isolation between the master output, output two and the third output is reinforced to 3000V AC. The reinforced isolation of output three is suitable to supply voltages to IGBTs or IPMs, which reduces the number of power supplies required to power robotic controllers and high power modules in factory automation. By integrating a reinforced isolated output, the ‘three in one’ RBC200F has an equivalent footprint 40 per cent lower than conventional solutions, claims Cosel. The RBC200F has built-in inrush current limitation, over-current, over-voltage, as well as thermal protection. The RBC200F measures 101 x 38.3 x 152mm (3.98 x 1.5 x 5.98 inches), or 101 x 38.3 x 164 mm (3.98 x 1.5 x 6.46 inches) if including a terminal block. Weight is 450 grams. An optional chassis with cover is available on request, as well as a vertical mounting terminal block. In the case of harsh or corrosive environments, a conformal coating option is available (Option C).